Officially called the Fighting Falcon, the all-weather multirole attack aircraft F-16C was also known as Viper by its pilots for its resemblance to a viper snake. The F-16C, which entered production in 1984, was among the most renowned F-16 Falcon variants. The first Block or version of the C model came with better cockpit avionics and modern radar, which helped improve the aircraft’s all-weather capability. The Block 50, which is made up of the later C models and considered as the eight major modification block of the F-16, has just received improvements, such as more powerful engine, advanced weapons and sensors, and new electronic warfare suite, as a result of combat experience. Besides USAF, the F-16 Fighting Falcon C model is being used by Greece, Bahrain, Egypt, Israel, Oman, Singapore, South Korea, Colombia, and many other countries. While flying a real F-16C requires outstanding flying skills, owning this Fighting Falcon wood model airplane won’t require you to put in the hours learning to fly. Sculpted from high-quality kiln-dried wood, this scale model went through several stages of fine sanding to ensure extra smooth surface. This scale model aircraft was then skillfully hand-painted and finished, and all the markings are elaborately done to come up with the most accurate representation of the original. 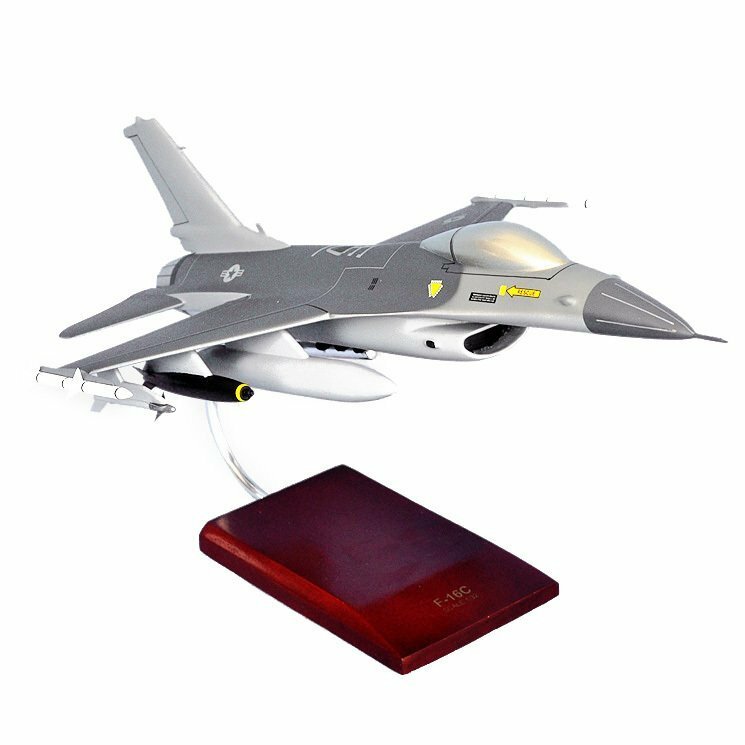 Breathe new life to your room or workstation by putting this desktop model aircraft up for display.